FAU's Sociology major is distinctive as a flexible skills based major. The major lets students choose a plan of study that suits their career interests, focuses on topics that intrigue and challenge them, and helps them to build their own "sociological tool kit" for addressing personal and social problems. Every course includes coverage of core skills and basic knowledge of the discipline in addition to material that is distinctive to the topics. Because of how the major is designed, students who major in Sociology will have many opportunities to develop the skills necessary to ask and answer questions about social behavior, social structure and change, and social trends as well as to read skillfully, write and speak clearly and conduct effective presentations. The B.A. in Sociology requires a minimum of 120 credits. Students majoring in Sociology are required to earn a grade of "C" or better in all sociology courses that are counted towards the Sociology major's minimum requirement of 30 credits. All majors at FAU require a minimum of 45 upper-division credits (including the 30 required for the Sociology major). Sociology majors are strongly encouraged to take more than 10 courses in Sociology and/or to pursue a second major, minor or certificate program in another field. As long as all University and College requirements are met, the Sociology major allows students to reach their required number of credits in any way they choose. 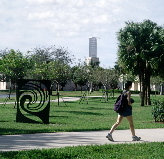 Students entering FAU as freshmen must meet the University’s General Education/four-year degree program requirements as listed in the Degree Requirements section of this catalog and the College’s requirements as set forth under Undergraduate Programs in the Dorothy F. Schmidt College of Arts and Letters. Students transferring to Florida Atlantic University must complete both lower-division requirements (including the requirements of the Intellectual Foundations Program) and requirements for the college and major. Lower-division requirements may be completed through the A.A. degree from any Florida public college, university or community college or through equivalent coursework at another regionally accredited institution. Please see Transfer Student Guidebook for more information. Sociology majors are required to take eight credits of appropriate college-level courses in one modern foreign language. College-level transfer credits or credits earned through CLEP or Advanced Placement Examination may satisfy or be applied toward the foreign language requirement for graduation.